May brought a sharp change in conditions in the eastern part of Montana. As early as April 30th reports of exceptionally dry conditions started coming in from Daniels, Sheridan, Roosevelt, McCone, Richland, Dawson, and Prairie counties. Drought concern was elevated in Wibaux and Fallon Counties and spread to encompass the eastern third of the state. The main cause for the dramatic shift was a combination of low precipitation, high temperatures and wind. Producers reported culling herds, 20% of average crop starts, and nonexistent native pastureland. While the last few years have seen good precipitation in this part of the state, surface moisture depletion during the spring planting season has had dramatic impacts on the local economy and many are comparing it to the last drought period of 1988. Judith Basin and Fergus, as well as Silver Bow and Jefferson counties also continue to be monitored closely for drought conditions. April continued to benefit water supplies around the state. By the end of the month almost all drought concern was removed from the state, with the exception of Wibaux and Fallon Counties. Nationally, the country saw its first record low of drought concern since records first being kept in 2000. By April 25 the U.S. Drought Monitor had the smallest drought on record (6.1%). As of May 9, 2017 Montana was 98.45% drought free. While this is great news, the areas of Judith Basin and Fergus, as well as Silver Bow and Jefferson counties continue to be monitored closely for the potential for drought conditions to resurface. 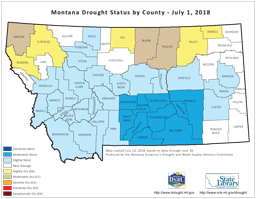 As such, they continue to be categorized as D1 on the Montana Drought Status by County Map found on page 2 of this report. March came in like a lion and left like a lamb, as the saying goes. The first two weeks of the month brought snowpack increases to all basins across the state. The second half of the month saw all valley snows melt with increased temperatures and decreased precipitation. Snowmelt occurred below 7000’ east of the Continental Divide and 6000’ west of the Divide. By April 1st, most basins in Montana had near to slightly above normal snowpack for the rivers and sub-basins west of the Divide. Exceptions east of the Divide include the Gallatin (87%) and the Smith-Judith-Musselshell combined basin (70%). Read more in the NRCS Montana Water Supply Outlook Report as of April 1st, 2017. February brought much needed moisture to Montana for northern and southern river basins. Precipitation ranged from 158-222 % of average. All Montana river basins are now above 110% of average for the Water Year (October-September). Basins that saw the largest precipitation gains in February included the St. Mary-Milk, Upper Yellowstone, SunTeton-Marias, Madison, Lower Clark Fork and the Kootenai. The driest areas were concentrated west of the Divide, the east central part of the state near the Musselshell basin, and in parts of the southeast. January can be summarized as cold and dry. Precipitation ranged from 50-70 percent of average for the majority of the state. There were some pockets of above average in the south central and south east as well as along the southeast part of the Highline. One major anomaly was in the upper Rocky Mountain Front area where 200-300 percent of average precipitation was seen for the month. The driest areas were concentrated west of the Divide, in the east central part of the state near the Musselshell basin, and in parts of the southeast. December provided significant snows after a record warm November. While valley snow accumulations ranged between 4-12 inches, the high elevation snowpack only started to reach average snow depth by the end of the month. Similarly, the Snow Water Equivalent (SWE) levels were almost all below 50% of average at the beginning of December, but by the end of the month were reaching near normal levels. Lower SWE levels were recorded at SNOTEL sites in the Little Belts, the Dear Lodge Mountains, and the Sapphire, Swan and Lewis Ranges. With January, February, and March still to come a normal winter snowpack and SWE accumulation are anticipated. The US Drought Monitor shows improved conditions only in the Southeast corner. This reflects that Montana’s snowpack essentially arrived in one month. Likely improvement is anticipated in the months to come, but long-term trends should not be overlooked with short-term weather changes. November was warm and dry in contrast to the record wet month of October. Temperatures for November ranged from 3-12° F above normal across the state, with the majority of warmer temperatures being seen in the east. Precipitation was 5-25% of average for the majority of the state. Precipitation averages for the month of November raised concern in Ravalli, Powell, Deer Lodge and southern Lewis & Clark, as well as Rosebud, Custer, Prairie, Dawson, McCone, and Garfield Counties where low flows this past summer caused impacts to soil moisture, groundwater springs, and water for grazing cattle. October was a wet month statewide, ranking in the top ten wettest Octobers for the last 122 years. Average temperatures for September and October saw a marked decline from record highs in August. October was the 62nd coolest October of record, while the statewide composite average for the last 12 months was 2.3°F above normal, with nine of the last 12 months having warmer than normal temperatures.